Celebrating Singapore Shores! : Smile, Singapore got crocodile! Crocodiles should make us smile. Only healthy mangroves can support these magnificent top predators! Die die I want to see the crocodile! 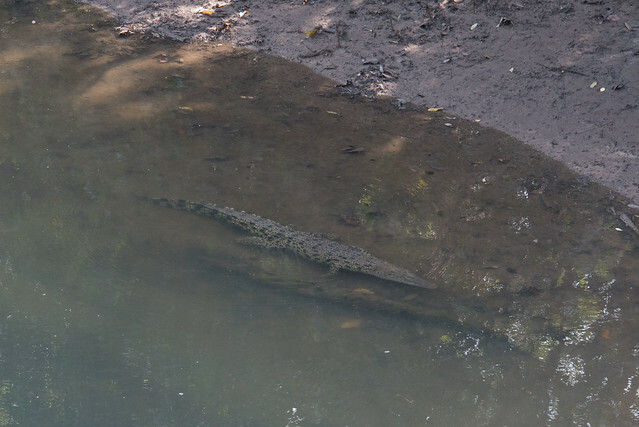 The best chance to spot a crocodile is to go with a nature guide. 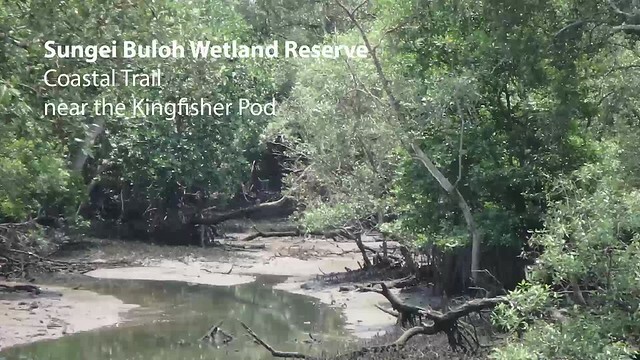 Join the walk at Sungei Buloh Wetland Reserve by experts of the Herpetological Society of Singapore! These young naturalists love reptiles (and amphibians) and would be delighted to show you the crocodiles and wildllife of the Reserve. They have two walks on 21 Jan (Sun): walk 1 and walk 2. We often don't even see the crocodile when it's right in front of us. Can you spot the crocodile? Often, what we think is a crocodile may instead be a large Malayan water monitor lizard. Our monitor lizards can grow to 2m or longer. The monitor lizard has a short snout and slender tail. 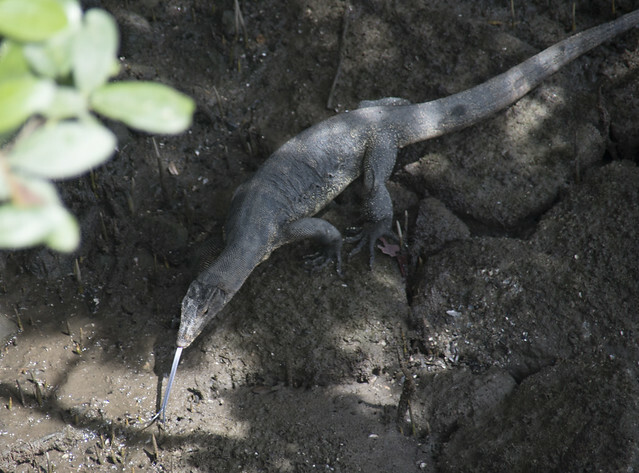 And the monitor lizard has a long blue forked tongue which it regularly flicks out now and then. The crocodile doesn't have such a tongue. A crocodile on the other hand, has a long snout and jaws full of teeth! And a thick fat tail. Its scales are also much larger. Here's more about how ordinary monitor lizards are mistakenly identified as all kinds of animals that don't even occur naturally in Singapore. So it IS a crocodile! What should I do?! Admire this magnificent creature, from a distance. Crocodiles often lie in the sun, to warm up. Sometimes, a crocodile has its mouth wide open. It does this to cool down on a hot day (much like the way a dog pants). It's not doing this to show aggression or to get ready to bite. 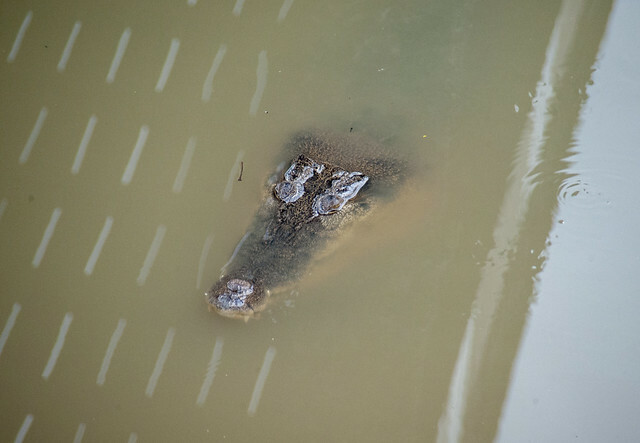 This small crocodile is splashing mud on itself probably to cool off from the heat. If we are patient, we may observe a crocodile hunting! Crocodiles usually hunt while submerged in water, stealthily swimming slowly. Here's a video of a crocodile on the hunt. Often, crocodiles just lie motionless, pretending to be a harmless log. This is also why it is important to stay on the path and not go into the water. Crocodiles are awesome predators that eat all kinds of animals. Small crocodiles may eat insects, frogs, crabs and fishes. Adults can eat larger prey including fish, birds and mammals, hunting mainly at night. They may also eat dead animals. Despite our worst fears, crocodiles don't eat people. 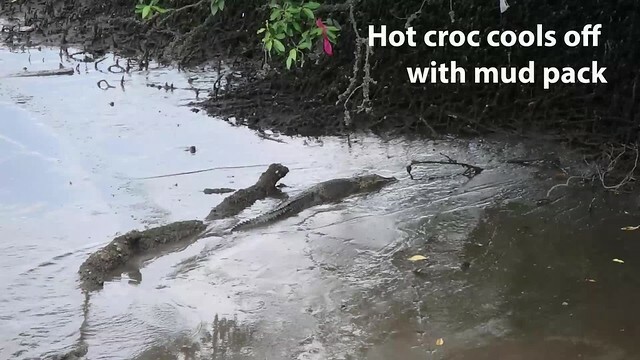 Where can we spot crocodiles in Singapore? In the past, crocodiles were common even in the Singapore River, Kallang River, Sungei Seletar and Kranji Reservoir, and Pulau Tekong. They are no longer common and are now considered Critically Endangered. 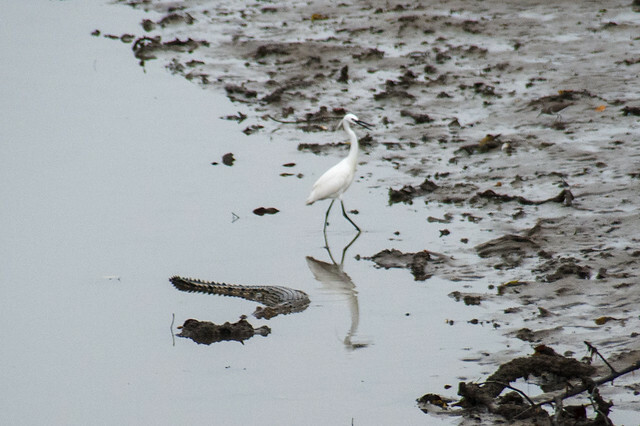 The best place to spot crocodiles nowadays is at Sungei Buloh Wetland Reserve. 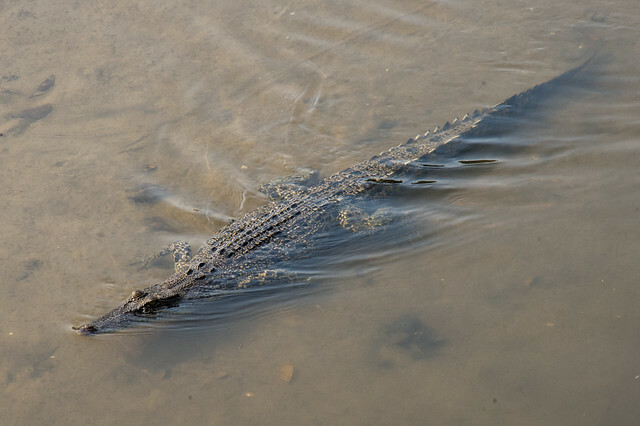 Large awesome crocodiles are most often seen near the Main Bridge especially at lowish tides. Smaller ones are also seen in the mangroves off Kingfisher Bridge. 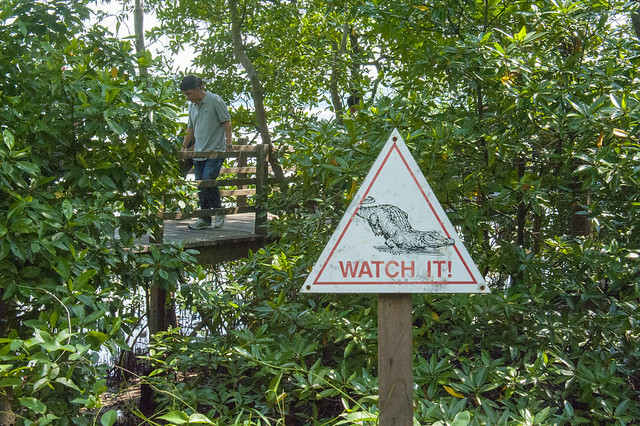 The prominent triangular "Watch It" signs posted all over the Reserve tells you where you might spot crocodiles. So if you see such a sign, stop and have a good look around. What should I do if a crocodile is real close? Like any wild animal, crocodiles will not harm humans if they are not disturbed or threatened, and if we keep a respectful distance from them. and reported in the media, started a conversation about crocodiles. Stay on desinated paths, don't get into the water. 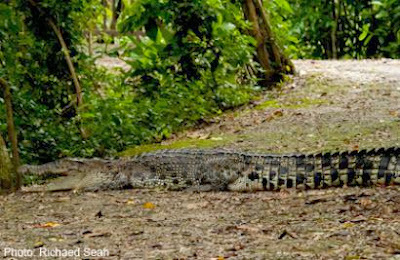 If a crocodile is spotted on the path, stay calm and back away slowly. Do not approach, provoke or feed the crocodile. 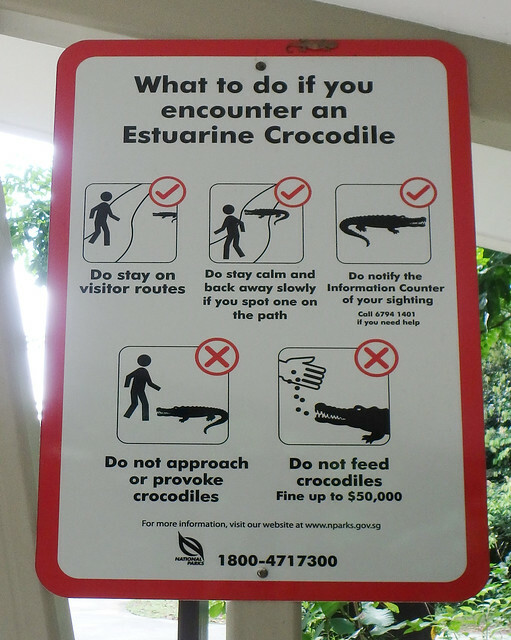 NParks has sensible advice on "What to do if you spot an Estuarine Crocodile?" 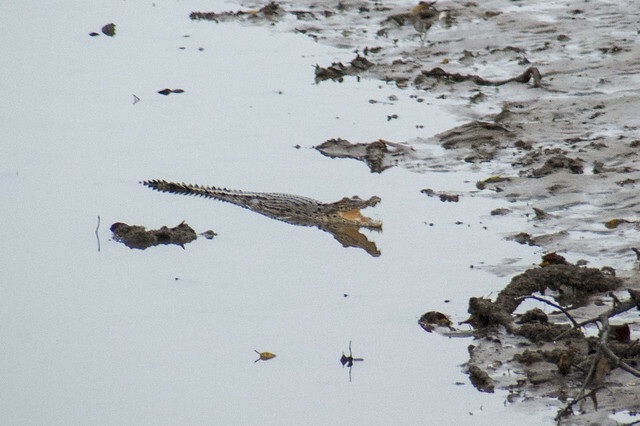 The best chance to spot a crocodile is to go with a nature guide. Join the 21 Jan (Sun) walk at Sungei Buloh by experts of the Herpetological Society of Singapore! These young naturalists love reptiles (and amphibians) and would be delighted to show you the crocodiles and wildllife of the Reserve. There are also free guided walks every Saturday at the Reserve, as well as many other exciting nature happenings there. Another way to get close to the crocodiles and wildlife of the Reserve is to volunteer with them. More details by NParks. 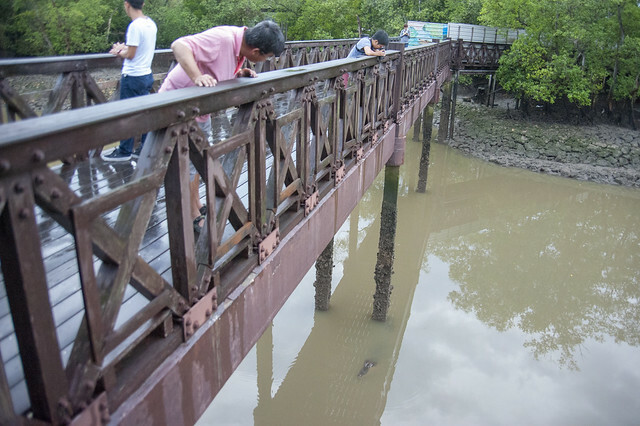 Crocodile under the Main Bridge at Sungei Buloh. Crocodiles are magnificent jewels that crown the mangroves and wetlands of Singapore! Smile when you see them! 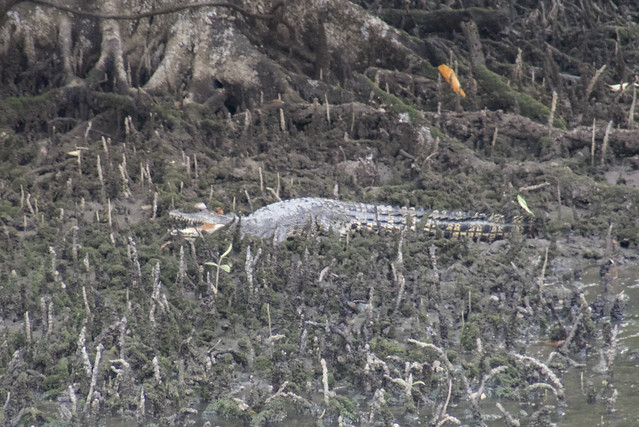 Estuarine crocodiles and what to do if you encounter one by NParks. Malayan water monitor lizards in Singapore on the wildsingapore fact sheets. Busting Myths about Monitors by Ivan Kwan on the Celebrating Singapore's Biodiversity blog. This article is first appeared in the wild shores of singapore blog.